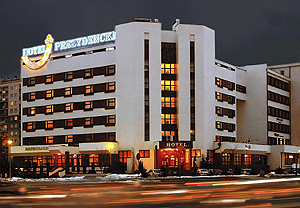 Opened on December 31, 1992, the Prezydencki hotel was the first 3-star hotel build in the Podkarpacie region offering exclusive service, discreet personnel, and friendly atmosphere. The hotel had as guests the Presidents of the Visegrad Group, peo pl e from the world of politics, business, science, culture and art. Located near the city centre, but in a quiet district (about 10 minutes walk), the hotel is first of all an excellent leisure place for people on business trips. In the hotel with a soul guests will enjoy professional services, comfortably furnished rooms and modern amenities. We offer 56 spacious single and double rooms, and four air conditioning apartments. In preparing rooms for our guests, we took care to join comfort and convenience and provide a perfect place for both relaxation and work. Classic and elegant furniture is provided, as well as mini-bar, radio, satellite TV and fixed Internet connection. The hotel facilities include: restaurant, drink bar, sauna, a beauty parlour, hairdresser, kiosk with papers, currency exchange, car parking. The Prezydencki hotel is the only hotel in Podkarpacie that participate in the elite program for Polish Prestige Hotels & Resorts - a group of particularly attractive Polish hotels distinguished by their location, standard and professionalism. Staying in Polish Prestige Hotels & Resorts hotel does not mean only the guarantee of high standard but it also means significant discounts. The hotel accept credit cards: VISA, MASTERCARD, AMERICAN EXPRESS, POLCARD, EUROCARD, HERMES, JCB, MAESTRO, PBK Styl, VISA, Electron, Diners Club. Dinner - 60 PLN (15 USD). conference 14 Pers. 20 s. 4 os. The daily rates in EUR change according to the PLN rate of exchange.